The Sochi 2014 Winter Olympic Games get underway this Friday with an opening ceremony inside a Fabergé egg-inspired stadium by sports architecture firm Populous. 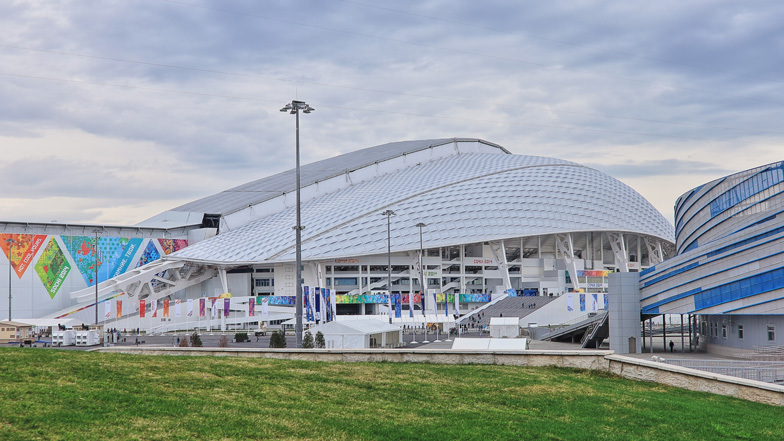 The Fisht Olympic Stadium is one of 11 new purpose-built venues designed for the 2014 winter games in Sochi, Russia, by Populous - the firm behind the London 2012 Olympic stadium - and it forms the centrepiece of the 200-hectare Olympic Park. The building features a temporary shell-like roof based on the jewel-encrusted Fabergé eggs that have become an icon of Russian culture. Constructed from translucent polycarbonate, this roof will facilitate light projections during the games and is likened by the architects to the snow-covered peaks of the Caucasus Mountains. The south side of the building was designed to shelter the stadium and spectators from the adjacent seafront, while longer elevations on the east and west sides open out to the plaza where the cauldron will be on show. During the games the 40,000-seat stadium will be used to host the opening and closing ceremonies, but no sporting events. It will then be converted into a 45,000-seat football venue for the 2018 FIFA World Cup, before being downsized to a 25,000-seat club for a local football team. Russia's bid for the 2014 Winter Olympics was part of a broader goal to step back onto the world stage as hosts of major sporting events (the country's last event was the Moscow Summer Olympics back in 1980). The challenge was threefold: to convince the International Olympic Committee that Russia had both the vision and the infrastructure to host such a major event; to develop the popular summertime coastal resort of Sochi into a world class destination for winter sports, and to design a stadium flexible enough to facilitate the Olympic ceremonies, then act as a venue for FIFA World Cup matches and, finally, become the home venue for a local football team. For the first time, an Olympic Park has been designed as part of a Winter Games master plan. This unusual step guarantees a unique legacy for these Games, marking Sochi out as a winter destination for decades to come. Within the park, the main level of the stadium is raised on a landscaped mound, providing stunning views from within. The unique engineering systems will enable truly memorable opening and closing ceremonies while, post-Games, the in-built flexibility of the stadium's design means its capacity can change over time to provide event configurations from 45,000 seats for FIFA World Cup matches to a compact, atmospheric 25,000 for local matches. Winning the bid for the 2014 Winter Olympic Games has not only reinstated Russia's reputation as a viable host for major events, but has transformed Sochi itself. The infrastructure that our work has helped create will regenerate the region, marking Sochi out as a year-round tourist destination and major new European winter sports centre.